Teferi’s Puzzle Box has gone from bulk rare to being nearly $3. This has been the result of its power in one specific Commander deck. Nekusar, the Mindrazer has spurned more price increases than any other Commander has done in recent memory. I think that Teferi’s Puzzle Box will get to $3 and then just sit there. There is no shame in tripling in a couple of months. It has just had too many printings and the decks that want it only want a single copy. There are vendors paying more than $1 for them. I would keep the one copy you need and unload them for everyone who got a free 98 card Mind Seize from Walmart. For my money I would rather be picking up Psychosis Crawlers for almost nothing. Remember that you are drawing a lot of cards too. Telekinesis is a rare from Legends and is on the reserved list. These are the only two things that is has going for it. It is not particularly powerful or interesting. It is a waste of a perfectly good name. This card is being bought by collectors so that it can sit in binders and do nothing. That is not the hallmark of a good spec. I would stay away. The only money there is to be made will be slow over a long period of time. Your cash has better homes. Who cares about giving cards to your opponents at the cost of five damage a turn? Usually I am wary of picking cards from a set so fresh. Prerelease prices are infamously high. This might be the exception to the rule. Journey into Nyx is a third set so it will be drafter less. Conspiracy will be out in less than a month. It is a set based around drafting so I expect less Journey to be opened than a normal third set. This is a great replacement for Desecration Demon once rotation hits. That is assuming that Mono-Black control is still viable. It will be losing the omnipresent Pack Rat but most of the removal will still be intact. I would not trade aggressively for them but I would not mind putting together a few play sets to sell in case things do get interesting come fall. Price of Glory is an interesting card. It comes down and shouts to your opponents not to play counterspells or combat tricks. It is a red take on City of Solitude. It is not used competitively so it must be going up due to casual demand. I do not trust it to maintain this price. It was an uncommon. The name is generic enough it can be reprinted any time Wizards decides to. I would not be surprised to see it in Conspiracy. I would trade mine away. I really like this card. It can be played without any mana as an instant to disrupt graveyard shenanigans or just as a free psuedo-Lobotomy. It can be played by any deck regardless of color. This is a powerful turn one play after a Thoughtseize or Cabal Therapy. I really like the prospects of this card. Phyrexian mana makes it difficult to reprint outside of a supplemental product. Most of those are based on casual and multiplayer formats rather than hosing finely tuned Legacy decks. It has seen widespread adoption in Legacy sideboards and has even made the occasional Modern appearance. I would target the promo copies with the alternate art. The normal art foil is $17. There are still places with the promo copies available for under $10. It is on the reserved list. It sees play in Legacy. It is cheap green removal that can get rid of opposing blockers every single turn. It does not target. That means that True-Name Nemesis and Nimble Mongoose are legal victims. I think that the recent success of Porphyry Nodes has helped remind everyone of the power of this one drop. It has had some aggressive growth recently and I do not know how much more room. I would trade for something with room to grow. I really like this land as a mana fixer in UW Midrange decks. It has seen adoption in Modern and even makes the occasional appearance in Legacy decks like UWR Miracles. We have recently seen movement on the Twilight Mire as a $30 card. Most of the rest of the filter lands have moved up to $20. There are still some cheap ones though. Fire-lit Thicket, Wooded Bastion and Rugged Prairie are all about $12 to $14. They have room to grow. Graven Cairns is a steal at $6. It is the only land with two printings. It originally appeared in Future Sight and teased the cycle. I has shown steady sustained growth for a while now. I wouldn’t mind trading for any of the cards in this cycle. I especially like the prospects for Cascade Bluffs. I am glad to see Lotus Petal begin to rise again. This is the only foil copy available. It is used extensively in multiple Legacy decks including Reanimator and Sneak and Show variants. ANT and Imperial Painter decks also play the full four copies to try to get their combos started as soon as possible. I don’t see this coming down below $30 ever again. I would gladly trade for these. Foil Simian Spirit Guides are around the same price and this is much more versatile. Silent-Blade Oni has only been printed in Planechase 2012. It was in the ninja deck and allows for some gross plays like stealing your opponents planeswalkers from their hand while hitting them for six damage. May it can grab you a Progenitus or Violent Ultimatum. Sometimes he gets you nothing. The demon ninja is cool but its sole value is to casual players. They just can’t seem to make up their mind what the price should be. $5 is too little. $9 is too much. This week was good for the oni but sooner rather than later it will hit its ceiling again and fall back down. I would look to trade these away on the way up and for them when they come back down. What do you do when you want to try out one of the greatest formats Magic has to offer? Look up a budget deck list and play some games. Manaless Dredge is competitive and costs less than one land in most other decks in the format. It can put up a fight without having to play a single dual land and that is exciting. Nether Shadow is a source of repeatable free graveyard recursion. The deck runs the full four but with so many reprintings in core sets the price is still next to nothing. I could see you getting these as toss ins on a larger trade. The deck has not been posting results in paper but online it has several Top 8 showings. I think that other cards from the deck will continue to grow such as Ichorid, Bridge from Below and Cabal Therapy. There are some cheap opportunities in Chancellor of the Annex and Golgari Grave-Troll. The gods from Journey into Nyx are exciting. They are each powerful and interesting Commanders. 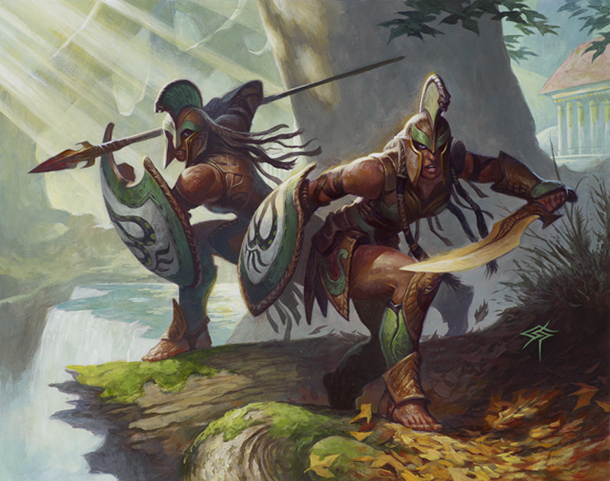 I fully expect Keranos to show up as a 2 of in UWR or Grixis Control decks in Modern and Standard. Why did his price go down then? Packs are being opened. This is normal for any mythic rare in a set. Once prerelease and release dates are behind us supply will creep up to meet demand. Journey into Nyx has thrown two wrenches into this. First is a card called Deicide. Several gods values plummeted just upon announcement of the god centric removal. Second are the god packs. Some booster packs of Journey into Nyx contain all fifteen of the Theros gods. Your childhood dreams of opening a pack with fifteen rares can finally come true. The instances of this occurring are staggeringly low. It is easy to see after seeing a couple dozen showing up on Twitter that some people are reluctant to pay as much as they were beforehand. My advice would be the same as almost every other release situation. Sell or trade away your mythics as soon as possible. Pick them up again in a few months at a fraction of the price. I would still hold onto foil copies of the gods because Commander, Cube and Casual players will never scoff at a god. He is a uncommon from Arabian Nights on the Reserved List. There are not a lot around and there will never be any more. Stealing creatures is fun but there are more powerful options. He does not see play in any format that I can determine. I thought $50 was a little high. I think his old price of $40 was about right. I would trade him away. Maybe you can a Drop of Honey for him. At least then you can play it. I would look at this as a opportunity. It is a pain land and has seen three printings. It is used in Izzet Modern decks that want their mana and they want it now. Expect to see it in Splinter Twin and Storm variants. This card has seen substantial growth recently. It is only natural to see it drop a little before it starts climbing again. We know it can get to $8 and possibly higher. I would gladly trade for these at $5. Offer your Journey god and a toss in for two.